When you think of food vending machines, the first things that come to mind are chips and sodas. You can find these reliable dispensers just about anywhere: schools, offices, medical centers, and a lot more. As technology continues to improve, vending options become more diverse as well. Thinking of going into the vending business? Take a moment to read about how these machines have evolved. Older machines were quite simple, but also didn’t offer a lot of choices especially when it comes to eating healthy. In the past, it was all about sodas and snack products like a bag of chips. However, due to more people adopting a healthier lifestyle, newer machines are taking a turn for the better. Good thing, too, since most of these dispensers are in schools and offices where nutrition often suffers incredibly. Modern vending machines are able to carry healthy options such as smoothies, coconut milk, dried fruits and yogurt. Additionally, there are also dispensers which are a little unusual but nevertheless, still popular because of their convenient features. For those craving for some sweets, a cupcake ATM is available for you to snack on. Looking for kosher-friendly ones? That’s not a problem. Kosher-sausage dispensing ones are littered in some of the major cities. But food is not the only thing that’s good about using these new contraptions. You can also take advantage of their “artificial intelligence”! 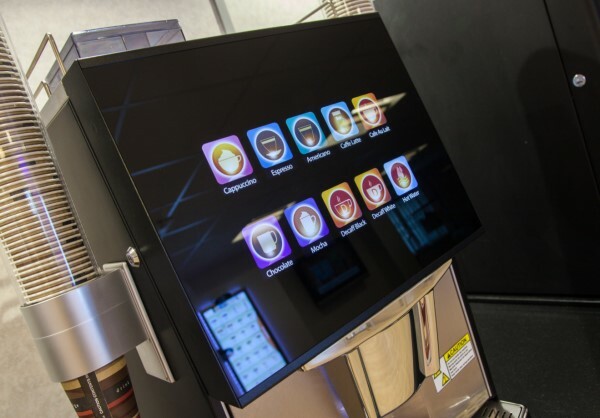 Just imagine having a device in your office that will dispense what you usually order through the use of facial recognition. There’s no saying what options will be available for you in the future with modern vending machines that just keep on improving and giving you more choices aside from the typical sodas and chips ones in the past. Take a look at some of the dispensers that are available for franchise. Take note that some of these do not even dispense food but are still quite popular. Hot Drinks – Aside from basic coffee (coffee, creamer and sugar), cappuccino, lattes, and espressos are popular vended hot drinks that you can choose from. Hot chocolate and healthier options like tea and soup are also available. Cold Drinks – This list would not be complete without cold drinks being vended. The great thing about this type of vending machine is the wider range of products it can vend as compared to hot drinks. Popular choices include sodas, juice, milk and ice tea. Sweet and Savory Snacks –What’s a can of soda without a bag of chips to pair with? Most places with vending machines will always have both types side by side. You can choose from biscuits, pastries, cookies, candy bars and chocolates. Some might even have sandwiches to dispense. Novelty –Kids are the biggest consumers of novelty items such as gumballs and candies that are being vended. You usually find these types in places such as amusement parks, shopping venues and other places where families get together. These are also simple yet sturdy contraptions given that their consumers have the tendency to shake them vigorously. Water –It’s an entirely different category from the cold drinks dispenser because they can be a little complicated. They usually have filters fixed to be able to dispense purified water for your safety. Some dispensers have ice as well for more refreshing drinks. Medicine and Hygiene Items –You usually see them in public washrooms, dispensing products such as tampons, sanitary napkins, tissues, and essentials for baby (diapers & wet tissues). Some machines also dispense condoms, soaps, toothbrushes and aspirins. Health Food – They’re becoming quite popular these days, especially with the demand for “smart food for kids”. These usually store healthy items such as unsalted nuts, wholegrain cereals, yogurt, and healthy drinks. Depending on the trend, machines will be able to dispense different products and whatever consumers will demand for, you can be sure that a vending machine will be available for their needs in the near future.